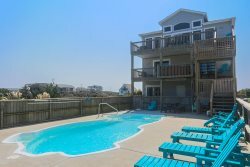 Situated on the soundside of Corolla in the picturesque Villages of Ocean Hill community, Seas and Trees is a beautiful 5-bedroom Outer Banks vacation rental boasting all-new furniture, beds and bedding, decor, landscaping and a hot tub for the 2018 season! When you arrive at Seas and Trees to start your vacation, you’ll be greeted by an open floorplan and a bright and airy atmosphere that’s sure to make you feel right at home for the week. The owners of this incredible vacation residence have spared no expense in outfitting the house with the finest furnishings and decor, and it shows! Kick back and relax in the spacious living room that features a large sectional couch, two comfy chairs and a flat-screen TV for your viewing pleasure. Whip up your favorite foods in the fully-stocked kitchen, and gather around the dining room table to enjoy a delicious home-cooked meal and some quality time with friends and family during your stay. In addition to being just a short distance from the waters of the Currituck Sound, Seas and Trees is also conveniently located just a few minutes from the beaches of the Outer Banks (3 min drive). Load up the car with all of your beach gear and drive just half a mile to the nearby Oceanside parking area—or take a short stroll to this beach access using the paved pathway that runs along the west side of the main road through town. When you reach the parking area and beach access, simply walk along the wooden community pathway that takes you over the sand dunes and right onto the wide expanse of beach that awaits you for a day of fun in the sun. Once you’ve wrapped up your day at the beach, come back to the house and hit the brand-new bubbly hot tub that was just installed for the 2018 season. If a quiet evening under the stars is what you seek, step out onto the large top-level deck on the east side of the house, which offers plenty of Adirondack chairs for your family to spread out and enjoy the evening. This is also an excellent spot to sip your morning coffee and watch the sun rise on the horizon each morning! Two comfy cushioned rocking chairs are located on a lower-level covered deck if you want to escape the sun for a while, and a spacious screened-in porch provides a great getaway for game nights or al fresco dining with an ocean breeze. Seas and Trees has something to offer everyone in your family—including your four-legged friend! This dog-friendly vacation rental home is located on a small court off a quiet side street, making it the perfect place for walking your furry family member without the worry of heavy traffic passing by. And if you want to take Fido on a longer excursion for a little adventure, head to the Currituck Banks Maritime Forest nature path, which can be accessed less than a half mile up the road from Seas and Trees. This .75-mile-long path winds its way through the scenic maritime forest of Corolla and ends with a wooden overlook along the edge of the marshland that borders the Currituck Sound. If climbing the Currituck Beach Lighthouse—a popular Outer Banks attraction—is on your list of things to do for your upcoming vacation, you’ll be pleased to discover this landmark is located less than five minutes from Seas and Trees. Plus, the four-wheel drive area of Corolla is just one mile from your vacation home, so you won’t have to venture far to take a tour to see the herd of wild horses that roam the beaches of the northern Outer Banks up close and personal! Seas and Trees truly has it all, but when you stay at a vacation rental home within the Villages of Ocean Hill community, you’ll also have access to a wide array of community amenities ranging from a swimming pool, tennis and volleyball courts, shuffleboard and basketball goals to a fitness center (for a fee), nature path, dock and gazebo, playground and beachfront snack bar. What more could you want on your next Outer Banks vacation? Book your escape to Seas and Trees today! Top-Level: Open floor plan includes an updated Kitchen, as well as a Dining and Living area with access to the sun deck and the screened porch. One King bedroom with TV, a private deck and access to a full bathroom. Mid-Level: Large covered deck, entry foyer, two King Bedrooms (both with TVs) and a shared full bathroom. The fourth King Bedroom is also on this level and has a TV and access to a full bathroom. A washer and dryer are located in hall closet. Ground-Level: Twin Bedroom with TV and a full bathroom. Exterior: New hot tub, screened porch, large covered and uncovered decks, a carport with an outdoor shower and beach equipment storage closet. The large backyard has access to the community walking trail leading to nearby beach access and Villages at Ocean Hill community amenities—just an 8-minute walk and an even shorter bike ride to the beach! Upgrades for the 2018 season include all-new furniture, a brand-new hot tub, new beds and bedding, new TVs in the living room and in each bedroom, new deck furniture, new landscaping outside, and new decor throughout the house!